Xenophobia is an emotive word which means ‘a strong fear and dislike of people from other countries and cultures’. So what has xenophobia got to do with teaching English as a foreign language to children (apart from the fact that, for the sake of this ABC, it conveniently begins with ‘X’)? Keith Sharpe has referred to this benefit of early foreign language learning as ‘early start immunisation to later negative attitudes’. Although such ‘immunisation’ is difficult to prove or measure, it is potentially a major benefit that, as teachers, we should do our best to promote as an integral part of our jobs. There are many practical things that we can do to ensure that children learn to positively value people from other countries and cultures. These include, for example, showing where everyone in the class is from on a world map with photos and flags, including personalised activities in which children have the opportunity to talk about their country, food, families etc, celebrating different festivals, telling stories or reading picture books that focus on themes of difference and empathy such as Something Else, taking turns to teach and learn simple phrases such as ‘hello’ / ‘goodbye’, ‘please / thank you’ in each other’s languages. 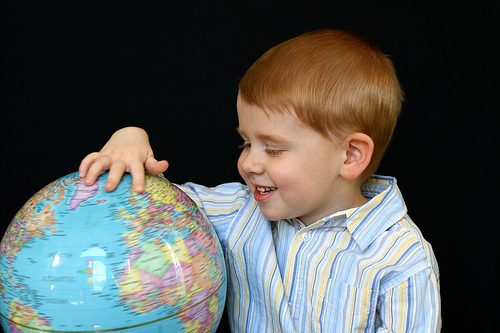 It opens up their world, and by getting children of different nationalities to share a little bit of their world through their language, we are helping them become citizens of the world. My Cat likes to hide in boxes is a great book to use in class to introduce the idea of other nationalities and languages…Have you used it? I bought Something else after you recommended it at TESOL Spain, but I haven’t had the chance to use it yet! Many thanks for writing and good to see you back here too! Great to hear you agree – I think sometimes as teachers we get so caught up with the utilitarian side of our role – getting through the curriculum, the coursebook, preparing children for exams etc that it’s easy to lose sight of the wider implications of our role as educators too. Thanks for mentioning ‘My Cat likes to hide in boxes’ – yes, I have used it, and agree that it’s a great one to introduce the idea of other countries and cultures. The rhyming couplets in the story make it very memorable and provide for lots of teaching possibilities too. It’s also lighter in tone than ‘Something Else’ which is very moving and quite intense, although I’ve always found that children respond very maturely to the story. If you’re going to use ‘Something Else’, by the way, do have a look at the photocopiable materials based on the story which I contributed to Gail Ellis and Jean Brewster’s book ‘Tell it Again!’ (Penguin English, 2002) which may save you a bit of preparation! I completely agree with your emphasis on our wider educator remit – as teachers of young learners we need to move beyond the ‘language as object of study’ approach towards a more ‘language for international communication and global citizenship’ approach. For me, global citizenship teaching skills need to be firmly embedded in teacher education courses for English language teachers. By teaching language to young learners in age-appropriate ways AND equipping them with global citizenship skills, we are able to raise children’s awareness of difference and in turn, promote both acceptance and tolerance. In the context of xenophobia, I was inspired by a session from ‘Foyer’, an organisation which isn’t working primarily with English learning, but rather focuses on teaching minority children’s home languages in mainstream schools. Foyer operates within the wider context of cultural diversity, specifically issues relating to integration of migrants at Dutch-speaking schools in the Brussels Region and the Flemish Community. Foyer’s key principle is “onderwijs in eigen taal en cultuur”: education in native language and culture. This began in 1981 and is present in 6 Dutch-speaking schools in Brussels. It integrates the mother tongue of 550 immigrant children into the curriculum. Foyer encourages a multilingual and multicultural system, teaching children’s native languages to further facilitate their second language development, and maintains that rejecting a child’s language in school is rejecting the child. It can also be a challenge for immigrant parents, as many choose a Dutch speaking school even if they do not speak the language. Foyer supports them, reducing the gap between home and schools. The parents are also encouraged to learn Dutch and attend school meetings. Foyer helps them to reflect on multilingual education. For me, this is a brilliant example of how we as language teachers can help children develop their intercultural competence. We can learn many lessons from organisations like Foyer and start to see children’s L1s as superb resources for language learning rather than as ‘interference’ or obstacles in the development of English. Similarly, integrating aspects of children’s home / background cultures in English lessons via personalised materials and tasks shows we value them as individuals, respect differences and provides a far richer child-centred learning environment. It would be great to hear from others around the world who have incorporated a more multicultural dimension into their YL classrooms. Many thanks for this richly informative contribution and the useful website links. Great to hear about the conference you were involved in and many thanks also for sharing your presentation. Extremely interesting to learn about the work of Foyer too, and completely agree about the importance of valuing home languages in contexts where the language is different in school in order to provide for genuinely inclusive learning. It’s very encouraging to hear how the theme of our wider educational remit as language teachers resonates with you. Thanks also for making the links to the development of intercultural competence and learner autonomy – two vital areas which we need to integrate in a systematic and consistent way in all our work with children. Hi Carol – I just received my MATESOL this past Friday and have not yet begun to teach, but I stumbled across your blog and am really enjoying reading your posts and the following discussions. I find that many of the points you are making about the larger role of ESL teachers, the preservation of home languages, and the importance of language learning for all children resonate strongly for me and are very similar to what I wrote in my capstone paper/teaching philosophy. I’m looking forward to reading through more of your posts! Many thanks for your message and congratulations on getting your MATESOL! It’s great to hear that you’re enjoying reading the posts and I’m glad that many of the points about the wider role of language teachers resonate with you. It’ll also be interesting to hear from you once you start teaching and how practical experience in the classroom may modify and/or expand your views. I’m nearly at the end of the ABC now and it’s encouraging to know that you find it enjoyable. Thanks again for writing.